This is, again, a South Indian recipe, which is made from green mango and tur dal. This is a very popular dish in Southern part of India, known by different names in different states. We, Kannadigas, call it as Mavina Kayi Tovve. 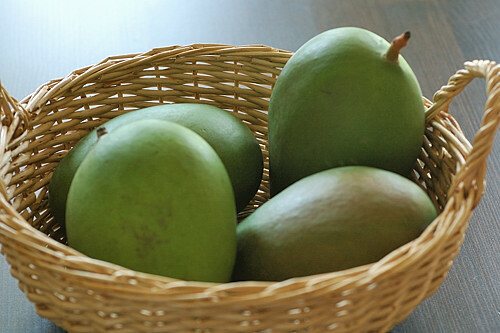 We get good quality of green mangos in summer in India. This is the right time to know about different types of green mango recipes. Green mango has got its own flavour and taste, there is no need to use any spice for taste and flavour. I am preparing this dish without using dry masala or any dry spices. This is a wonderful, multipurpose, side dish, which can be served as substitute of veggie. My mother used to prepare this dish for dinner, when there is a shortage of vegetables in home. This dish can be served with rice or rotis. Let’s see the preparation of tasty and tangy Mavina kayi tovve. Wash tur dal with plane water and add 2 cups (around 300 ml ) of water to it or you can measure the water 3 times that of tur dal. Pour washed dal with water directly in to a pressure cooker (capacity of 2 or 3 liters), leave it to soak for 10 minutes. Close the pressure cooker with lid and Keep the cooker on medium low flame. Allow it to whistle thrice and remove the cooker from heat. Cooking on low or medium flame, helps the dal to cook properly and softly. Allow the cooker to cool down. It will take 10 minutes to cool down. Meanwhile you can do other preparation. Wash the green mango. Peel of the skin and chop it into very small pieces ( Or pulps). Keep it in a bowl. Wash and clean green chillies and cut them into one inch length. Keep them in a plate. Place a sauce pan on medium heat. Pour cooking oil into it. Wait until oil gets heated. Add mustard seeds to it, wait until they splutter completely. Add fenugreek seeds, cumin seeds, chopped green chillies, curry leaves, hing and haldi, one after the other. Stir it while adding the ingredients. Add half of the chopped green mango to it and mix it with a spoon. Cook it for 2 to 3 minutes so that mango pulps will get softened. I asked you to use only half of the green mango, you can keep reserved remaining half portion of chopped green mango. You can taste the dal and then you can add remaining part of green mango pulp according to your taste. Add cooked tur dal, salt and a pinch of sugar to it. Allow it to boil for 5 minutes. Add chopped coriander leaves and mix it the help of a spoon. Take out from heat and close with the lid. Tasty and tangy mavinakayi tovvi is ready to serve. Isn’t it easy to prepare!